You may have already made the switch to coconut oil in the kitchen. The new superfood is thought to slow aging, help your heart and thyroid, protect against illnesses like diabetes, arthritis and Alzheimer’s, and even help you lose weight. Depending on the temperature of coconut oil, the different consistencies can be used for a number of beauty hacks. Whether heated and used as a massaging body oil with other holistic ingredients or as a thick under-eye cream to reduce puffiness, lines and dark circles, it’s the perfect skincare product for any daily skincare regime! You can also ditch your face wash and use coconut oil. It works wonders on the skin and can help draw out dirt, oil and other toxins. Mix two teaspoons of oil with one teaspoon of castor oil (use more coconut oil for dry skin; less for oily skin). Massage into the skin using a warm, wet washcloth to your face, then wipe off excess oil. To make a soothing, nourishing lip balm, melt four tablespoons of grated beeswax and two tablespoons of coconut oil in a glass bowl over simmering water, stirring frequently. Once melted, remove from the heat and add up to ten drops of your favourite essential oil. Pour into a tin and apply to lips once cool and solidified. Coconut oil can be used in a number of ways for hair from preventing dandruff on the scalp to fixing brittle, dry ends. It’s rich in anti-microbial properties, lauric acid, and medium-chain fatty acids that are thought to strengthen hair, condition the scalp, and encourage regrowth. So if you’re worried about all those chemicals used in hair products…get out the coconut oil! 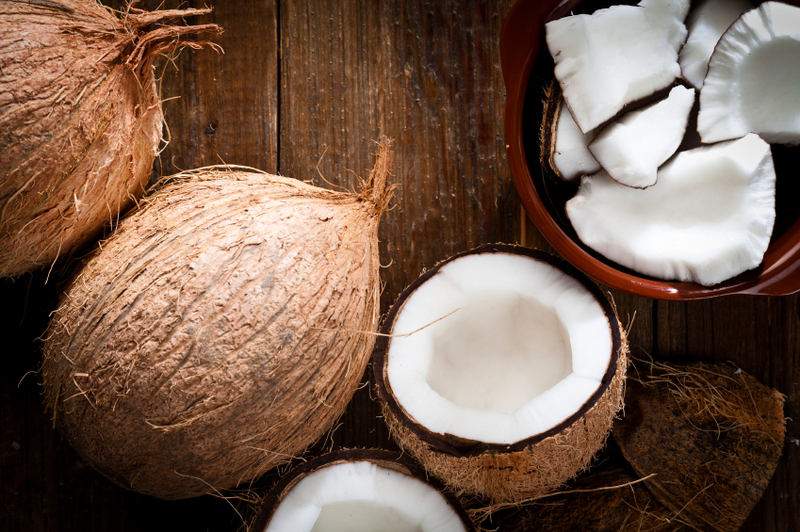 By massaging coconut oil into your nails, the nutrients can help strengthen and prevent fungal infections. It has also been known to help cure athlete’s foot. The best time to rub coconut oil into the nails is right before bedtime, which can help stimulate the nail growth and also get rid of hang nails and rough and torn cuticles. The coconut has long been an important food source in tropical areas of Asia, Africa, the Pacific and South America and is now hailed as a superfood in the Western world. According to WebMD, this cholesterol-free oil has antioxidants that may help reduce the risk of disease. Registered dietitian Lisa Young recommends using coconut oil to replace butter or lard when you’re cooking or baking. Ethnic dishes benefit massively from using coconut oil for its light and subtle additional flavour to certain dishes. Try adding it to your favourite curry recipe, or using it to bake your favourite muffins or brownies. But, don’t forget, coconut oil is high in calories and you should get most of your fat from unsaturated sources including olive oil, avocado, and nuts. There are many uses for coconut oil when it comes to the home. It makes a decent furniture polish that can be safely used on any wood, granite counter tops or metal surfaces. Not only can it keep your house dust free, it is also known to help cover up scratches too. It can also be used as a stain remover. Mix one part coconut oil with one part baking soda for a natural solution on upholstery and carpets. Other uses include an insect repellent when combined with peppermint essential oil, or a quick and easy way of shining your favourite patent heels or leather boots.